The 2012 Wimbledon finals have been set in stone. It is safe to say that the 2012 Wimbledon finals is bound to make history, whatever the outcome. Roger Federer played his absolute best semifinal match against world (possible soon to be former) #1, Novak Djokovic. Federer was all over the place, almost as the tennis ball was the size of a soccer ball, he was just not missing. Though Novak did show some pretty sweet tennis in the second set. Though Federer showed the Serb why he’s won the title six times…Roger Federer finished him off in four sets. By reaching the 2012 Wimbledon finals, Roger Federer has the opportunity to win a record tying seventh Wimbledon title (Pete Sampras has 7 Wimbledon titles). To make even more history that Roger Federer can make if he wins the 2012 Wimbledon finals, he can recapture the ATP #1 ranking. By being #1 again, he will tie Pete Sampras with the most weeks at #1 (286) and possibly be the standalone record holder. It’s a tall order, though I have a feeling that we will witness history in the making come Sunday. Andy Murray made some of his own history today; by reaching the 2012 Wimbledon finals, he is the first male British player in nearly 75 years to reach the final Sunday. Just by reaching the finals, he should be proud of himself. I’m happy and shocked at the same time; I didn’t see the crazed Andy who complains about damn near everything (clothing, strings, racquet, shade of green the grass is, etc.). He kept it together against a very strong Jo-Wilfried Tsonga. The match was impressive, the two exchanged baseline rallies, volleys, serves, dives, and just about everything else (except for Tsonga’s volley to his family jewels). Murray buckled down in the fourth set, coming up with some very impressive shot making to edge the Frenchman in 4 grueling sets. Reaching the 2012 Wimbledon finals will be Andy Murray’s fourth attempt to capture his elusive first major title. 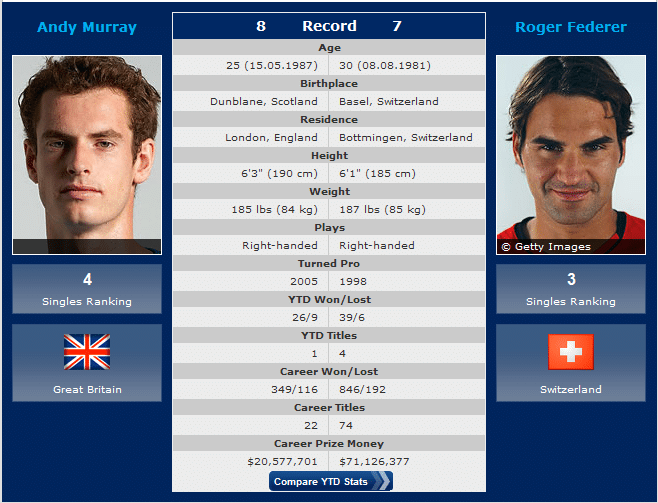 Roger Federer and Andy Murray will meet at the 2012 Wimbledon finals on Sunday July 8, 2012. This will be the first time since 1938, a male British player has reached the final at the All England Club. Talk about pressure. Predicting the 2012 Wimbledon finals between these two is tough; the only surface that they have met on has been a hard court, and Federer is infinitely better on this surface. Though Murray will have the whole stadium egging him on. The two have met a total of 15 times with Murray being one better (8-7). Though Federer beat Murray most recently in Dubai, straight sets. What does Andy Murray have to do in order to win the 2012 Wimbledon finals? I don’t really think that Murray will have much of a chance to best Roger, I mean seriously, Federer is one of, if not, the best tennis players to grace the green grass courts of Wimbledon. Roger owns this tournament and Murray is just another ‘hopeful.’ Murray is going to have to pull out some really BIG guns come Sunday. For Andy to stand a chance he’s going to have to outsmart the Swiss. Murray will have to focus on his return of serve, if he can return most of Federer’s serve he might have a chance to go the distance. Murray will absolutely want to stay away from leaving short hanging balls, Federer will put those away easily. Murray will have to make every attempt to keep Roger from coming to net, Andy has a decent pass but Federer has a better volley. What does Roger Federer have to do to win the 2012 Wimbledon finals? First, I strongly believe that Federer will win this, easily. Though if Andy Murray comes out swinging for the fences, Federer will have to serve well. That’s the bottom line. If Fed can get 70% of his first serves in, then he can take control of the point easily by moving Andy around, wearing him down. Federer will have to press at the net as well, which he’s done a lot more of this year. Federer has done a fine job at shortening points, keeping the rallies at a minimum will be an ideal tactic for the 2012 Wimbledon finals. What I saw from both players today was absolute power, which will make the 2012 Wimbledon finals a sight to be seen. To officially make my 2012 Wimbledon finals prediction against Andy Murray and Roger Federer; I predict that Roger Federer will win in straight sets 6-4, 6-4, 6-2. I’ll be watching the match, I invite you to live chat with me via twitter, follow me! I also invite you to leave your own 2012 Wimbledon finals predictions in the comments below.